I noticed a few papers up on arXiv last week that correspond to some old posts, so I thought I’d make a quick note that these people are still doing math research and maybe you are curious about it! 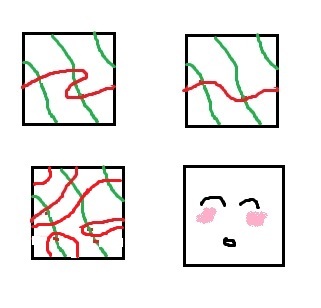 We last saw Federica Fanoni and Hugo Parlier when they explored kissing numbers, and they gave an upper bound on the number of systoles (shortest closed curves) that a surface with cusps can have. 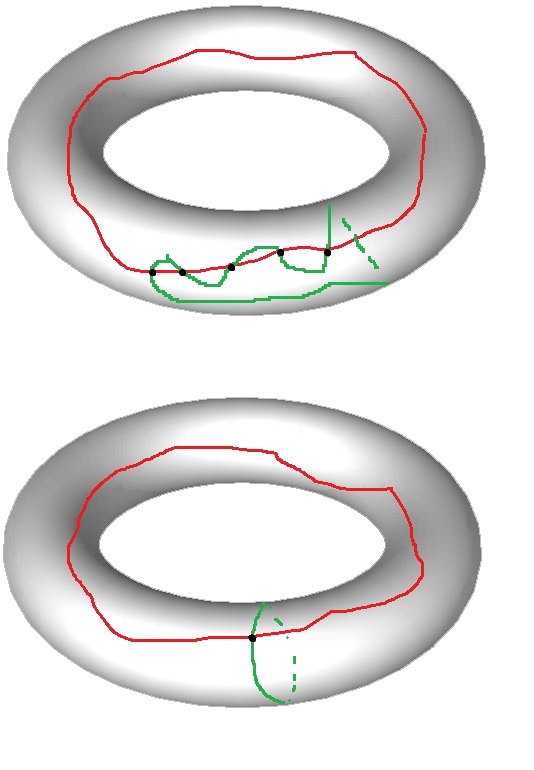 This time they give a lower bound on the number of curves that fill such a surface. Remember, filling means that if you cut up all the curves, you end up with a pile of disks (and disks with holes in them). So you can check out that paper here. Last time we saw Bill Menasco, he was working with Joan Birman and Dan Margalit to show that efficient geodesics exist in the curve complex. This new paper up on arxiv was actually cited in that previous paper- it explains the software that a bunch of now-grad students put together with Menasco when they were undergrads in Buffalo, NY (UB and Buffalo State) during this incredible sounding undergrad research opportunity– looks like the grant is over, but how amazing was that- years of undergrads working for an entire year on real research with a seminar and a semester of preparation, and then getting to TA a differential equations class at the end of your undergraduate career. Wow. I’m so impressed. 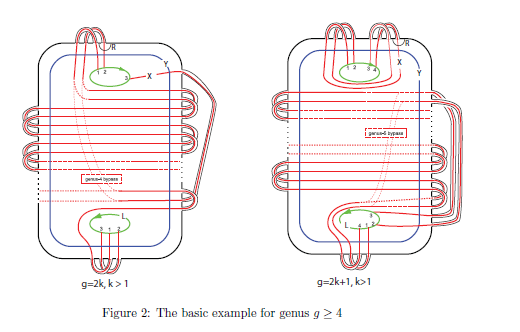 I got sidetracked: the software they made calculates distances in the curve complex and the paper explains the math behind it and includes lots of pretty pictures. My friend Jeremy did a guest post about baklava and torus knots a long time ago, and of course he’s got his own wildly popular blog. He also has a bunch of publications up on arXiv, including one from this summer. They’re all listed in computer science but have a bunch of (not-pure) math in them. The paper I worked on over that summer at Tufts with Moon Duchin, her student Andrew Sánchez (note to self: I need a good looking website I should text Andrew), my old friend Matt Cordes, and graduate student superstar Turbo Ho is up on arXiv and has been submitted: it’s on random nilpotent quotients. Moon and Andrew and others from that summer have another paper which has been accepted to a journal, it’s also about random groups and is here. It was super cool, I saw a talk at MSRI during my graduate summer school there and John Mackay (also a coauthor on that paper) was in the audience and this result came up organically during the talk. Pretty great! There’s another secret project from that summer which isn’t out yet, but I just checked two of the three co-authors webpages and they had three and four papers out in 2015 (!!!) That’s so many papers! So I don’t know when secret project will be out but I’ll post about it when it is. I really enjoy posting about current research in mathematics and trying to translate it into undergrad-readability, so I’ll try to continue doing so. But this Thursday you’ll read about cinnamon buns instead. Yum. If you haven’t already, I suggest you skim through my introduction to curve complexes post before reading this one. It has a bunch of the vocabulary I’ll use. Also, here’s an exercise: why, exactly, is the curve complex locally infinite? I didn’t say exactly explicitly, but take a look and see if you can convince yourself of this fact. So far we’ve seen a few properties of the curve complex that were discovered a long time ago. This object, by the way, was first described in 1978 by W.J. Harvey. [A lot of people mention this, but wikipedia has the actually citation. I guess because it’s not online.] 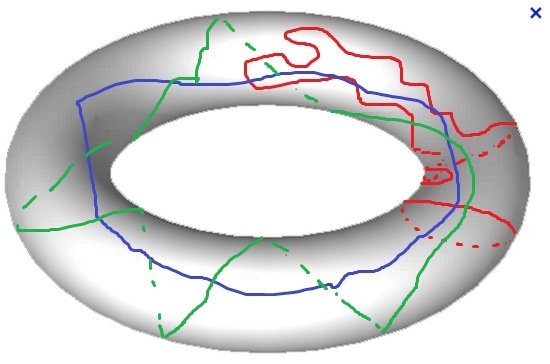 In October, Joan Birman and William Menasco submitted a short paper with a new property of the curve complex: that it needs to take better care of its hair. 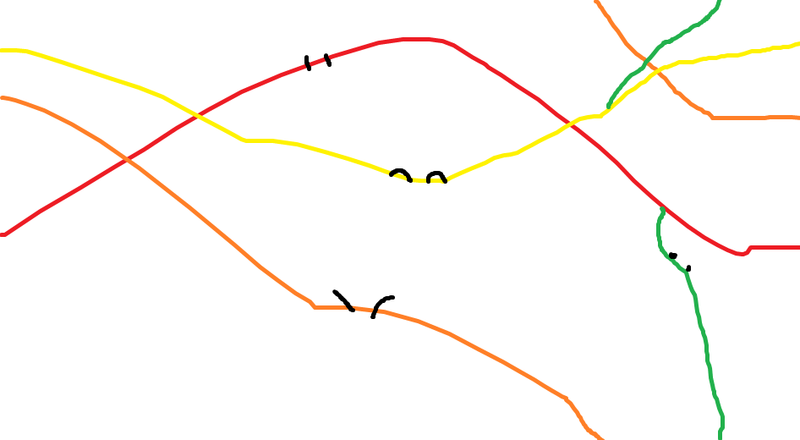 I meant, that the curve complex has dead ends. Well we’d better figure out what dead ends are, eh? They involve geodesics. A geodesic is a shortest route from A to B. In a plane, geodesics are just straight lines. That’s using the usual metric, way to measure distance. But what if we used a different metric? For instance, in Chicago, the fastest way between places is *not* a straight line, because I can’t walk through walls and houses and trees etc. There’s often two or more geodesics between A and B, by taking the north-south grid lines first, then the east-west, or vice-versa. You could use a staircase pattern to get between, say, six corners and Humboldt park. 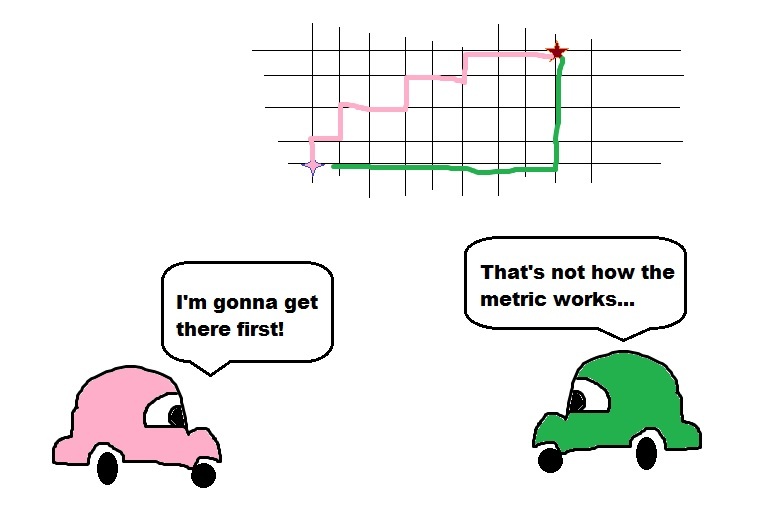 This whole thing is an aside about the taxicab metric. You could also do a giant loop and then do the usual L shaped route, but that wouldn’t be a geodesic because it’s not the shortest way to go. Point being, we can have a bunch of geodesics between two points. In fact, the curve complex admits infinitely many geodesics between two distinct points. This is pretty crazy. Remember from last time that it was hard to find points that were distance three or more from each other. This says that there are infinitely many routes that go between any two points. I don’t know why this is true, but it’s probably to be found in the seminal papers of Masur and Minsky on the curve complex. But let’s focus on the dead ends. Let’s say you start at a city A and you head to a city B along a geodesic with length n. We say B is a dead end with respect to A if you can’t extend that geodesic to length n+1. That means that for any city C distance 1 from B, the distance between A and C is less than or equal to n. Remember, ‘distance’ for us means the length of the shortest path between two points, a.k.a. the length of a geodesic. 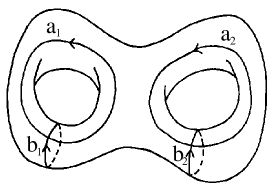 Why is it weird that the curve complex has dead ends? Well, we already agreed that it has infinite diameter, so intuitively you’d think that you could just keep adding cities to your route indefinitely. But you can’t! You can go on to another city from your dead end city, but there was a faster way to get there. I DID NOT MAKE THIS PICTURE; someone far more talented than I (either Birman or Menasco) did. But I’ll tell you one final fact before we go. It uses one last vocabulary word. A dead end with length n has depth k if you have to backtrack by k cities to extend the geodesic to length n+1. So if it takes you 10 steps to get from Milwaukee to Aurora, and you have to backpedal by two cities so that you can reroute to El Paso, which is 11 steps from Milwaukee, then the depth of the dead end at Aurora is 2. Here’s the final kicker: every dead end of the curve complex has depth 1. So chew on that! More math later!